Today the Carnegie building is the home of the Anderson Center for the Arts. This building is the only remaining building in Anderson that is a Neo-Classical structure. 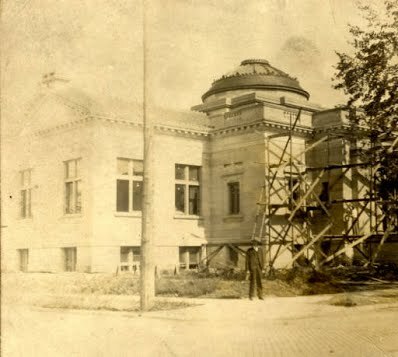 Carnegie Library under construction beginning in 1902 and completed in 1905. The land was donated by the city of Anderson. On April 20, 1905, the library was dedicated and the public was given tours of the new building. This building was the home of the Anderson Public Library for 82 years, until 1987. The Carnegie building was listed in the National Register of Historic Places in 1985. Amelia Earhart, the famous aviator, once studied here in the Anderson Carnegie Building. The very first librarian was Katharine A. "Kate" Chipman who served the community from 1898 to 1914. It has been a long time in the planning process but is now complete and ready for you to experience. Come in and see the brand new Historical Photo Gallery at the Madison County History Center, 15 West 11th Street, Anderson, Indiana. The Gallery is open and free to the public every Monday, Wednesday and Friday from 9 a.m. to 4 p.m. The Gallery is a product of our extensive photograph collection and reflects our commitment to bring to the citizens of Madison County the best that history has to offer. Accumulated over the years through generous donations and photograph sharing by history-loving people in and out of Madison County, we are featuring this permanent gallery for all to enjoy. The Gallery is housed in its own room complete with seating for our visitors to spend as much time as they wish reminiscing about times gone by in Anderson and Madison County. Each photograph is identified to aid the viewer in recalling the scenes familiar and, in some cases, unfamiliar to many of us. It is our hope that we will be able to add to our inventory of non-Anderson photographs by encouraging either the donation or loan of old photographs by individuals from our neighboring communities who are willing to share them for the benefit of everyone. Likewise we encourage anyone with old photographs taken anywhere in Madison County to bring them in and let us copy them, or if you desire, donate them. Our plan is to feature each display, including the themes, for a three month period and then change it to something new; thus, we will have four new displays each year. By doing so, we hope to encourage visitors to return again and again to see and appreciate this wonderful display of our shared heritage. One subject we do not have in our collection is a photograph of the "Green Lantern" or "Skatemore" nightclub/skating rink building that was located on the west side of Anderson on what was then the old Moss Island Road and is today Gene Gustin Way. If you have a photograph of the building under either name, we would certainly appreciate having the opportunity to copy it. The History Center's downtown Anderson location will afford an opportunity to those working in the downtown area to come in on their lunch hour and spend some leisure time examining these great photographs from our past. For groups, we suggest calling ahead to let us know when you plan to visit. We especially encourage the various high school reunion planning committees to consider including a visit to the History Center during your reunions. Funding for the Gallery is by grant from the Teaching American History Project and through the generous support of finances, materials and time by Madison County Historical Society members Ted Vinson and Marty Kettron. For more information, question or have a photographic donation, please call the office at (765) 683-0052. Ask for Stephen Jackson. The Madison County Historical Society has many assets in its collection but none more extensive than the hundreds, if not thousands, of old photographs we have accumulated over the years. They are the windows to our past and thereby have revealed a great deal to us about who we are. Each one has a story to tell. By researching these valuable treasures, we have been able to unlock some of their stories; stories that have long been waiting to be discovered and enjoyed. We exhibit them at the History Center in our Historic Photo Gallery. This photo display, Carnegie Library, begins in September, 2014 and runs through December, 2014. The pictures on the left and below are a small sampling of the photographs of the Carnegie Building in Anderson since 1905. 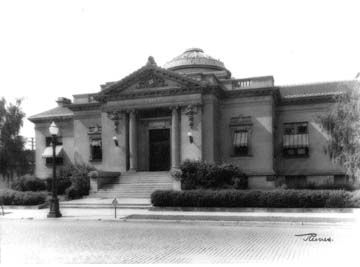 You will be able to see earlier photos of the Carnegie Library at the History Center in the Photo Galley. Everyone is invited to visit the Gallery and view these photographs.